Inside Diameter Choose an option10/64"11/64"12/64"13/64"14/64"15/64"16/64"
Note: the last photo is an example of deep blue & clear coating on Payne Replicas. 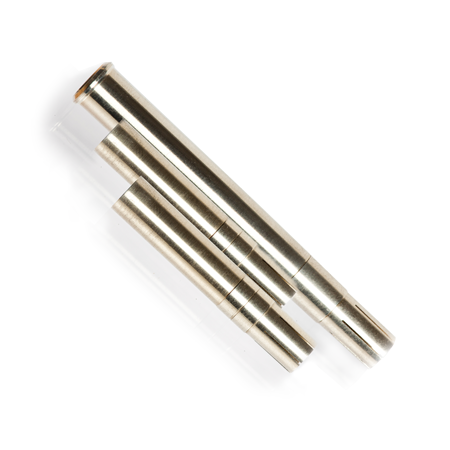 Our nickel silver ferrules are machined from solid 12% nickel silver bar stock. These ferrules feature simple, traditional good looks in the ever popular Swiss-style. The females have a simple welt and the males have a single, decorative groove machined in the center of the shoulder. Our ferrules have won popular approval because they combine exceptional affordability with the highest quality machining. Due to the high volume of production and innovative machining techniques, we can offer these ferrules at prices far less than tube-stock ferrules. What’s better than a beautiful, superbly-functional product that costs less? Only ice cream. And maybe not even that. Ferrule sets can be blued. When we blue, we mask the tabs and they will remain bright; this is the traditional approach, and it allows you to feather the tabs before mounting the ferrules. Whole sets: two males, one female. Half sets: one male, one female. 10/64", 11/64", 12/64", 13/64", 14/64", 15/64", 16/64"